With cold weather and rain just around the corner, it is almost time to say goodbye to another trout season. Many of you will agree with me that the last month of the trout season in Tasmania is generally very productive. For me, April is an exciting time. I spend most of it targeting places like Arthurs Lake and Great Lake. I also concentrate on Four Springs Lake, which is only 30 minutes away from my home in Launceston. While these are all great fishing spots, there is also another option that is even closer to home. It fishes well at this time of the year and is a spot that should not be overlooked. The North Esk River is the place I am referring to. Launcestonians are often put off by the mere appearance of the very ‘silted up’ North Esk River. If you cross the Lower Charles Street Bridge on a daily basis, you will know what I am talking about. This is the end of the North Esk, one of the Tamar River tributaries. The anticipation surrounding the start of the fishing season seems to increase every year. We have had three months to decide where we will go on opening day, changed our minds ten times and finally decided that we will wait and see what the weather is doing. The highlands and the lure of big fish is ever present but this year it could be time for a change. 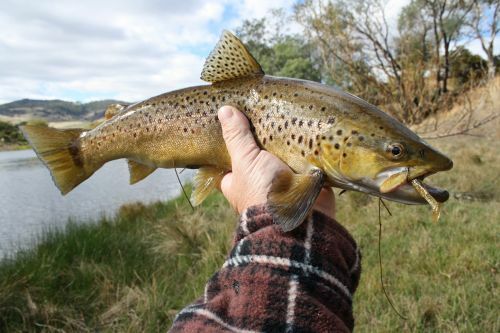 Often overlooked in the early part of the season, the rivers of Tasmania’s north and north east provide excellent fishing for fly, lure and bait anglers. The exact location of your chosen spot should be determined by your chosen technique and the height and colour of the water. For the fly fisherman, the Macquarie River has not fished as well over recent years as it has in the more distant past, but it looks better for this season. This difficult fishing is definitely due to low flows and warm summer weather. The best of the mayfly hatches will not start until October and dry fly opportunities will be limited. However, there is a silver lining! The high rainfall of recent weeks has swollen the river and backwaters have appeared down its course. These provide excellent fishing opportunities for all fishing styles. Fish have already been seen tailing throughout the lowland sections. A burst dam further up the system a couple of years back had a negative impact on the river and the best fishing was further down the water course. Good Winter rains over the last couple of years should invigorate it again though. Although the height of the water around Woolmers Estate is usually determined by the amount of water being released from Brumbys Creek, backwaters will still fill if enough rain falls around the source. Water quality in spring will not be as good as that coming from Great Lake but this will not deter the fish. Finding the best backwaters can often mean driving up and down a river looking for just the right spot. On the Macquarie that can mean from well above Ross to Longford. Small wet flies worked in eddies on long leaders over newly flooded ground can be productive. For the spin fisherman, shallow running lures and soft plastics will have the same effect. Although fish numbers may not be as high as those in other rivers, the quality of the fish can often make up for the reduced opportunities. Most fishing will be ‘blind’ but when light levels are low, trout can be found swirling in shallow water up adjoining ditches and channels. For those who prefer to use bait to chase their fish, an unweighted worm and light spinning gear is all you need at this time of year on all rivers – including the Macquarie. Expect the river to be running a little discoloured which will hide you from the fish but do likewise for them. Running into the Macquarie is the Lake River. This river always runs with a ‘milky’ hue but expect it to be more muddy than milky if heavy rains persist. For those who have not fished the Lake River, it holds larger fish than you might at first think. Access is not always easy but if you are willing to walk from the obvious public access points, back eddies and side gutters are not hard to locate. The best techniques to use are similar to those outlined for the Macquarie. Junctions of inflowing side creeks can provide a colour change and although not quite as productive for trout as they are for barramundi in the north, fishing these areas can be productive on an otherwise fishless day. The same can be said for those areas where major rivers meet. Remember that trout do not have eye lids and when all else is equal, they will choose to stay in clear water where they can hunt and see danger with relative ease. Brumbys Creek is another water which suffered badly from low levels during last season. It is regularly frequented on opening day by local anglers hoping to catch larger fish around the bottom weir. Trout often escape from the fish farm and present anglers with a better than average chance of a three pound plus fish. Trying to predict what the water level will be is almost impossible and it can also change very quickly. Rising or high water levels will bring fish into the shallows and provide the best fishing conditions. Sight casting to fish foraging in gaps in the weed is a real possibility. This is especially so above the top and bottom weirs where the flow spreads out and structure provides a break from the current. As with all of the rivers, stay away from the main flow and concentrate on slower moving back waters and ditches. The base of the weirs is also a reliable fall back as the turbid water provides currents in which fish can hold. If water levels are low and less than ideal, deeper undercut banks are worth prospecting. Since the ‘settling dam’ was built at the base of the Western Tiers, water quality has reduced alarmingly. Although you would be unlucky to see it, there is potential for a huge volume of dirty water to come thundering over the weirs. If this happens, go elsewhere! Near by, the South Esk is one of my favourite destinations for early season fishing. There are many backwaters in very accessible spots that hold catchable fish. The water around Longford is under fished and has been flooding over paddocks throughout July. Fat fish will abound. The Mill Dam area is well worth prospecting if there is not too much water. A clear summer flood is prime time fishing in the South Esk due to the numerous depressions that join the main river channel. When water rises into these areas along the entire lower course of the river, fish will move in to feed on drowned worms, spiders and grubs that were too slow to evacuate. Although it is difficult to polaroid these fish in the dirty waters of August and September, they are still there and very opportunistic. It is worth staying back from the edge of such areas and observing. Many fishermen feel as though the “dilution factor” is against them when there is such a large volume of water. This would be true if it wasn’t for the fact that fish will always gravitate towards a spot with the most food, plenty of cover and with no need to fight the current. Instantly, this rules out 99.9% of what is in front of you and often reduces the dilution factor to a better average than during summer. For the fly fisherman, the headwaters may provide the pick of the sport. If fishable backwaters are hard to find, water levels are too high or in fact too low for flood water fishing then the upper reaches are where you should go. It is very common to find dry fly fishing and certainly sight casting in the region around Mathina at this time. Look for clean water and start fishing. Even those fishing with unweighted worms will have success with long casts upstream. Slowly real in the slack line as it comes towards you while holding the rod to the side. If the line stops, quickly point the rod at the worm, wait a second and strike. If you wait too long, the fish will have the worm too far down its throat and you run the risk of damaging or killing a fish that you had no intention of keeping. If this does occur, cut the line and tie on another hook. Do not go looking for it! The Meander River has been touted as the premier back water fishery during early season rains. There are plenty of run off channels, creeks and even storm water drains that enter the river down it’s course. Since the Meander Dam went in, the days of huge floods around Deloraine are gone. I suspect that fishermen are the only ones who shed a tear. What the dam has done however is to maintain more consistent flows. The further from the dam we look, the more influence run off creeks will have on water quality and height. This tells us that unless we can find that wonderful slack water as the river spills into the paddocks, we should look a long way up river. Walking from the Westwood Bridge and searching in amongst the tussocks is reliable. Look for flat country surrounding the river bed. The further up river you venture, the rockier and steeper it becomes making it less attractive if you are wanting backwaters but they can be found in smaller numbers up to the dam itself. Before Huntsman Lake was built, my brother used to fish that exact stretch of river on opening day, never tie on a wet fly and always catch his bag. The fish were not big but all ate dries. The river upstream of the dam still provides the same quality sport. If you are looking for a feed, this is not the spot for you. The fish are tiny and best left to those who are there for the sport, intending to catch and release. The North Esk and St Patricks are influenced by rain falling in a different region. If other rivers are flooded out, this area (along with the Forrester) could be far less affected unless it has fallen in the east. Even still, it provides very consistent early season fishing. With Forestry plantations in the head water regions of the North Esk and St Patricks, neither river clears as quickly as it used to after rain. As I write this, the water running under one of the bridges of the St Patricks near my home has remained high and dirty for weeks. Both rivers can be fished in a very similar manner. Again, backwaters behind willow trees and ditches will produce plenty of fish for the worm fisherman. These are a little harder to fish with the fly and those using this method should venture upstream looking for clear water. There is nowhere better than the headwaters which provide kilometres of polaroiding water. It is tight but a small nymph placed in the right spot will elicit an aggressive take. As the fish are generally very small in these rivers, sight casting in dirty water is not easy. The fish need to be in centimetres of water in order to make a disturbance and although it does happen, it is not consistent sport. When the rivers are running just inside the banks (a ‘banker’) fish will sit right along the edge waiting for the river to spill over. The target area for landing your offerings is small but as there is less water these fish could possibly sitting in, your chances of success are very good. This is where celta fishermen really clean up! Before my fly fishing days, I learned about trout and their behavioural patterns fishing these exact rivers with a red and gold celta at this time of year. It is a great way to recognise good trout habitat through success and failure. All fish at this time of year are likely to be in less than ideal condition after spawning. They are generally a little bit ‘slimy’, out of condition and their flesh is less than perfect. Unless you really, really want a fish to eat, their table quality can not be recommended and I would advocate catch and release. This will see them there for you and everyone else during the summer months. If the water has spilt out into side ditches, paddocks and back waters, that is where the fish will be lying. Look for the cleanest water possible. If water appears unfishable, keep going upstream until you find cleaner water. Don’t fish fast water as most fish will have moved to slower side waters. Fish your flies and lures slowly as fish can be lethargic at this time. An unweighted worm is the best way to catch fish in flood conditions. Don’t simply go to the lakes!!!! The northern rivers can provide much better fishing and is a lot warmer! Headed on over to Lake Leake to catch up with Samuel and Connor who are also well known as the "'Lake Leake Boys'" to have a couple of days spin fishing the Elizabeth River. I checked in at the Lake Leake Inn with mine hosts Jan & Walter Milner who always greet their guest with a warm and friendly smile. After lunch (which was great & very filling) I headed on over to catch up with the Evans family and was met with another warm welcome at their household too. It was good to see them once again as well. Samuel wasn't around as he's working two days a week now with his Uncle in the building trade doing work experience as a carpenter which is a great trade to get into. The first 1.2km was unsuccessful, with only seeing 4 small trout that were easily spooked. Where I then swapped to a silver Aglia, and cast in to the faster running water where this little fish started playing up! First fish for the day, a nice little brown that was about 200grams. Back in the river he goes. We then walked through a heap of long grass, where Connor had caught a lovely brown that was about 340grams. A few photos and back in to the water he goes. In this time Adrian had caught a lovely brown around the 200gram mark as well. A few pics from todays fishing session at the Sth Esk river. George and I caught 12 trout. I got mine on softies and George caught a few on fly. Arrived at the South Esk with George Papp around 11am and fished till 3pm. I used soft plastics, while George tried the dry fly. We managed twelve between us and i got onto a couple of beauties around the 3lb mark, which were kept for a feed. The rest were released. Saw a few moving on top to caddis and spinners. Caught mine on Berkley Black & Gold T.Tails,and George got his on a hopper pattern. All fish were in top nick and fought hard, but this will be our last trip for the season. I had a couple of hours off today so I decided to hook on the tinny and explore the South Esk River in my little 12 foot tinny. I managed 7 in very short time, 3 taken on a klinkhammer dry and the rest on the orange bead - head nymph. As soon as school finished, Bailey & I had a look at the Upper Nth.Esk River this afternoon. The river was still running clear despite all the rain, we found the fishing a bit hard. We managed five brownies up to around 2lb, all caught on black n gold t.tails. We dropped a couple as well.